Human urge is to be with the source of urge. Propensity is the seed, devotion, the sapling, divine inspiration, the plant, spirituality, the flower and realization, the fruit of effortless effort. Mysticism is the way and the goal. It is a path without a road. It is an objective without motive. It is a quest without any meaning. Mysticism is the awareness of oneself as a part of existence; the awareness of the Supreme Being as the envelope of existence; the awareness of existence as the cause of existence itself. Mysticism is a happening. It occurs without noise. It is a dawn which never sets. It lights up the being without an instrument. It becomes itself in the process of becoming. The mystic eternally is. His timeless existence transcends human time in such categories as present, past and future. He knows the Knower which He himself is. He sees the Seer who is his own Self. The mystic knows not the ways of the world. He is untainted by hypocrisy, untouched by artificiality and unconcerned about social norms. He may not know manners and etiquette but he knows himself. He may be ignorant of the human laws but understands the laws of existence, being in Divine consciousness always. He does not please or displease anyone. Misfortune is his normal fate, poverty his forte and patience his property. He does not fear nor is the cause of it. He lives silently and in utter humility, like the fruit-bearing tree with its branches bent downwards. In a mystic experience of union with the Divine, God himself becomes the devotee; destination becomes the path and speech becomes the deepest silence. Who meets whom? asks Sant Jnaneshvara (1275-1296), the first saint-prophet of Maharashtra, in his mystical treatise Amritanubhava (‘Experiencing the nectar’) : How can the eye be opened when the unity between the individual Self and the Universal Self is dissolved? The sun sees everything. But is it possible for him to witness the beauty of his own rising and setting? If the moon tried to gather the moonlight then who has gathered what? How can words describe the Reality when the Supreme Speech itself disappears and no trace is found of any sound? The mystic is a witness to the play of the Pure Intelligence all over the universe and is possessed by the Truth he has experienced. Nothing can deter him from the path or disturb his inner poise. He smiles when ordinary mortals curse their fate and laughs when tortured as the 17th Century mystic, Sarmad. The sense of I and myness burns as incense before a mystic’s own being. Love breeds in him equanimity and fellow-feeling and he serves all as he discovers his own self in others. According to popular tradition, when Lord Vishnu, assuming the form of a dog, snatched a loaf of bread from Sant Namadeva (C1270-C1350 CE), he ran after him with the bowl of ghee shouting ‘Please, do not eat without it’. Before chopping a tree, Namadeva gave himself a blow with the axe to know how he felt. According to ancient Hindu scriptures, the ecstatic marks of a mystical experience may assume one or more of these forms – eyelids are half-opened and looks become stationery, body shivers or perspires, the hair stand on end, throat holds back feelings, breathing becomes extremely slow or fast, a sense of levitation comes and the heart is laden with joy. The tears of a mystic flow with liquid majesty – they are pearls of spiritual fervour descending from the depth of his soul. There is poetry in his eyes, music in his words and speech in his silence. What he utters is scripture. What he does not utter is truth waiting for discovery. Philosophy comes to him naturally. His company invokes purity in thought and transforms a person, as in the case of Narendranath who became Swami Vivekananda under the influence of Sri Ramakrishna. 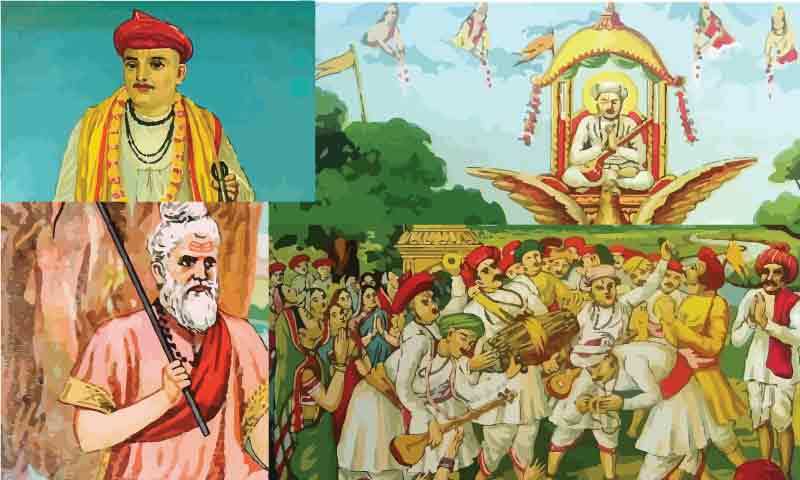 The medieval saints of Maharashtra, notably Nivrittinatha, Jnaneshvara, Sopandeva, Muktabai, Visoba Khechar, Namadeva, Chokhamela, Narahari, Sena, Samvata, Gora, Kanhopatra, Ekanatha and Tukarama were mystics of the highest order. They saw god as one would perceive the world of phenomena. They stressed the efficacy of God’s name, professed love and brotherhood, worshipped Viṭ̣ṭhala, the presiding deity of Pandharpur whom they identified with Lord Krishna, and poured out mystical verses (abhangas) in torrents. Janabai, the female attendant of Namadeva was so madly in love with the image of Viṭ̣ṭhala that she called him scornfully as ‘Vithya’, ‘Vithya’ when he did not respond to the calls of her heart. No place that is empty of him. Gora, the eldest among 14th – 15th Century Maharashtra saints claimed to have danced on mud with the Lord. Kanhopatra (C. 15th Century), the dancing damsel of Mangalvedha (district Solapur) thought that she was eternally wedded to god Viṭ̣ṭhala and refused the overtures of the Muslim King of Bidar. She left her mortal coil as one would leave one’s belongings. The soul of all things there. I reach forth far and free. The petty sense of ‘Me’.